All dogs love to chew! 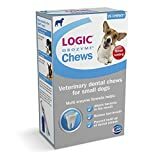 But instead of letting them chew bones, why not give them something to chew on that will clean their teeth and freshen their breath at the same time? 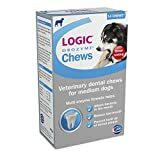 Introducing dental dog chews! 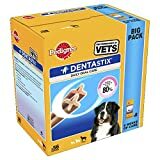 Dental care in dogs can be overlooked much of the time and can be tricky in the best of circumstances. Ideally, you have to start dental hygiene when your dog is still young. Dogs are prone to dental cavities and gum problems so it is important to maintain your dog's dental health. A dental dog chew can help prevent dental problems whilst your dog happily tucks into a tasty treat! 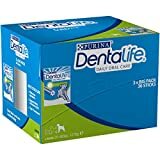 Dog dental chews are made from products that are safe for your dog. 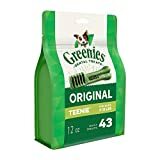 The leading brands have perfected a vast range of scrumptious chews that your dog will simply love to work their way through. So long as your dog is happy with the chew and it's helping their dental hygiene; everyone is a winner! Here are some of the diseases and oral infections that a dog might experience. Gingivitis is the inflammation of the gums due to plaque and tartar. Periodontal disease is the next stage after gingivitis where the tooth loosens. Pyorrhea is the infection of the bone that leads to loss of teeth. The risk of each of these can be reduced by giving your dog a nice dental chew from time to time! Dental dog chews are normally one of two types. 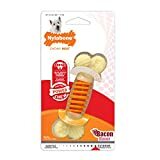 They tend to either be chews that your dog can actually consume (like rawhide or vegetable material), or a toy dental dog chew not for eating (normally made of hard nylon or hard plastic). It's up to you which you choose. There are many benefits of dog dental chews. These can help to prevent gum diseases of dogs. You want your dog to still be able to chew when they are older. All dogs have plaque build-up and the dental chews can help remove the plaques naturally. There are toothbrushes available for dogs but these can be very difficult to use, and time consuming too. Older dogs are the ones more likely to have dental issues, and teaching an old dog new tricks can be very tricky. You can use these chew snacks for play and activities. By giving your dogs dental chews, you can help them maintain their teeth. Since these dental chews can cut down on the tartar and plaque build-up in your dog's mouth, you can be sure that your dog is much more likely to have a healthy set of gnashers. Dental dog chews can also decrease the risk of gum disease, so that your dog will more likely be able to enjoy healthy teeth later in life. Hopefully it will keep their teeth nice and strong for much longer, enabling them to chew happily in their old age. Prevention is always better than cure. A dental dog chew goes some way towards good canine dental health and hygiene. How to enjoy the Olympics with your dog!